We offer for two types of Extensometer one of Electornic & second one is Mechanical to our customers. Mechanical Extensometer is an attachment to Universal /Tensile Testing Machines. It measures the elongation of a test piece on load for the set gauge length. The least count of measurement is 0.01 mm and maximum elongation measured is upto 3mm.This elongation measurement helps in finding out the proof stress at the required elongation percentage. · The required gauge length (between 30 to 120mm) is to be set by adjusting the upper knife edges and the scales. 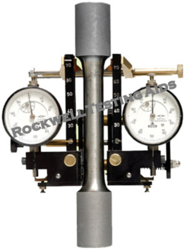 · Hold the test specimen in the upper and lower jaw of Tensile / Universal Testing Machine. · Position the Extensometer on the specimen. Position Upper clamp to press upper knife on the specimen. · The extensometer will now be fixed to the specimen by spring pressure. Set zero on both the dial gauges. · Start loading the test specimen and take the reading of load on the machine at required elongation or the elongation at required load. · For better accuracies mean of both dial gauge readings should be taken as elongation. This device is used for the determination of proof stress and Young’s Module values. With the Extensometer it is possible to measure correct strain values within the gauge length marks during a tensile test. In case of ductile materials the stress strain curve is well defined and it clearly shows the yield point i.e. departure from the straight portion of the curve. But in certain materials like high Carbon steels, Aluminum and Magnesium alloys, the straight portion gradually follows a curve entering into plastic region, making it difficult to determine the yield point, For such cases, it is advised to find proof stress value. The proof stress is a stress corresponding to certain amount of plastic deformation after the proportional limit is passed. In specifications of materials, this plastic deformation is expressed as a certain percentage of the gauge length. FEE – 5 is specially suitable for determination of Young’s modulus and 0.1 % to 1.0 % proof stress values. FEE-5 is suitable for almost all type of materials. The measurement accuracy satisfied all requirements of IS:12872-1990/ISO:9513 – 1989 & ASTM-E-83 class B2. Its reliable construction guarantees maximum safety of operation and longer working service/life also in case of raised application conditions.